With lots of miles to make up from the previous day, we got an early start. It helped tremendously that we’d decided to do another night at the hotel and were able to leave most of our stuff in the room. With light packs and full bellies, we made great time, hiking along a railroad track as the sun rose and the world woke up. We didn’t see or hear any signs of human life for several hours, and the world felt quiet and peaceful. 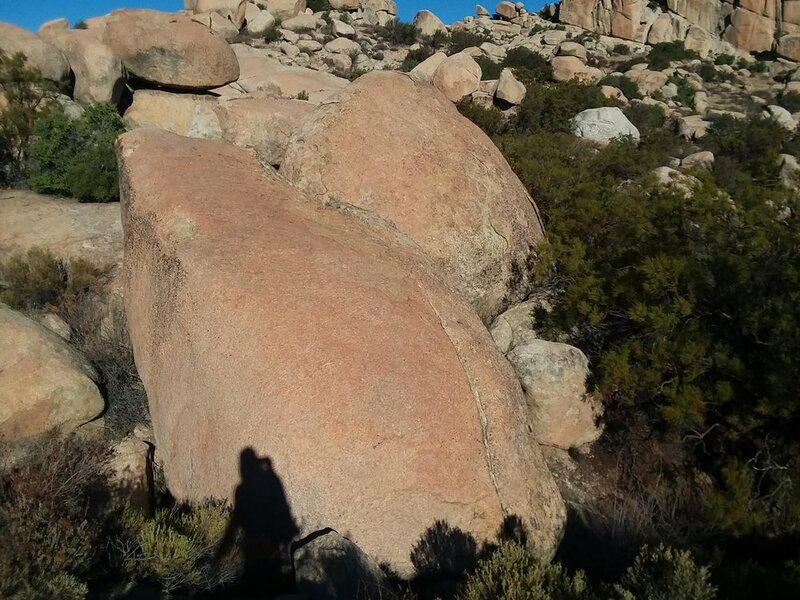 And also beautiful, with gentle hills covered with striking, pale boulders. We weren’t technically allowed to be hiking on the railroad (fun fact: railroads are privately owned and walking along them is illegal and considered trespassing) but we deliberately chose not to educate ourselves to this fact for the sake of easier miles. On previous long-distance trails we’ve always had lots of time for hours of introspective thought, when your mind can drift into a state of half consciousness. Traditional trails allow zen because you are constantly guided in a predetermined direction, little input required. Do we miss that? Yes. We hadn’t been able to find this blissful state so far and the railroad finally gave us the chance. Possibly, it was the first opportunity to truly disconnect from the present. We reluctantly left the railroad when it veered sharply north, and continued onto a road on the outskirts of a residential community just outside of Campo. We were surprised at how much money the area seemed to have. Lots of little ranches and horse farms, with riding arenas and stables. Many of the homes proudly displayed miniature American flags and patriotic memorabilia. We were still over a mile from the border fence, but it was definitely a surprise to see such economic stability. Or at least the semblance of it. More miles passed, with the day getting hotter and hotter. Eventually, the houses grew further apart and shabbier, and the feeling of being watched grew as we neared the border. A border patrol agent approached us as we crouched in the sparse shade of a bush while on a break and asked what we were doing out here. Unlike every other agent we’d met, he seemed visibly suspicious of our response. Almost all of the Border Patrol that we’ve encountered ask us what we’re doing, and upon response they are exceedingly polite but ultimately disinterested. This guy seemed a little more judgy than the others (not so shockingly, he was one of the only young white guy agents we’d spoken to). Still, to be fair, he was professional and respectful. We have consistently experienced a kinder border patrol presence than we expected. Just towards us, though, we can’t comment on how they treat others less...white and American. At this point, with a far too hot sun, a hostile environment, and the lure of a hotel, we were ready to be done. We trudged our final miles, following a truck trail up and over the last little hills, and rejoining the ever-present Highway 94, where we stomped our final stretch. With no way of getting back, other than a bus that wouldn’t be there for hours, we got to hitching. If we didn’t already detest 94, this sealed the deal. No one stopped. For over an hour. In the 90+ degree heat. Come on, y’all! Where’s that holiday spirit?! At long last, Tony the trail angel came along to save us. He had passed us going in the opposite direction on his way to ice cream, and had generously decided to stop on his way back when he saw that we hadn’t had any luck. With no hesitation, he offered to drive us all the way to the hotel, even though he was only about a mile away from his house. Thank you Tony! As we drove, he filled us in on all sorts of local history and landmarks. Information about the Buffalo Soldiers stationed in Campo, the local Native American tribe, Kumeyaay, and a tiny chocolate shop established in 1921 and still open for business, our business. Once again, the trail provided and people showed up for other people. Gotta love this world. Back at the hotel, we happily indulged in a food and beer coma, and got ready for an early morning. James, a water drop coordinator for Border Angels and one of the friend’s we’d met in Enrique’s office, had reached out to include us in a water drop he was leading the next day. The trailhead was only a couple miles from our hotel so it was meant to be. Looking forward to hiking with some cool people doing cool things!